In this post, I have invited Cristina Potters to be a guest and share one of her favorite recipes. Cristina is the author of Mexico Cooks!, a culinary and cultural website about all things Mexico. She is also known for giving outstanding tours. I’d like to offer my personal recipes for frijoles refritos and frijoles de la olla. 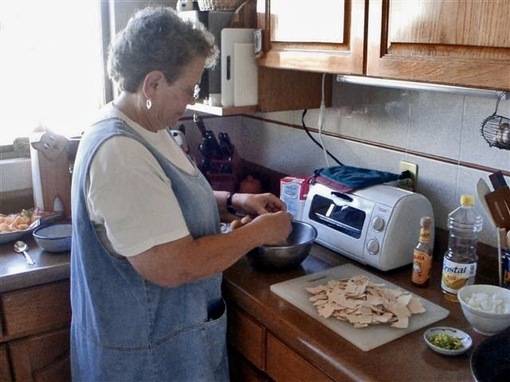 The following recipe for refried beans is not only simple and delicious; it converts people who turn up their noses at ordinary refried beans into folks who insist on another helping! 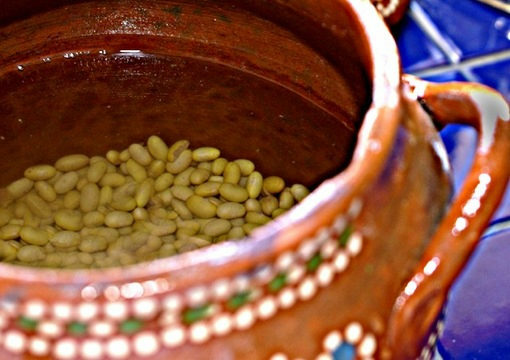 In central Mexico, the most commonly eaten bean is the peruano (peh-roo-AH-noh), an oval, yellow bean that cooks to a pale beige color with a creamy consistency. I like frijoles de la olla (freshly cooked beans, straight from the pot) served with a big spoonful of salsa fresca (chopped tomato, minced onion and chile serrano, salt, and roughly chopped cilantro). I often steam white rice, fill a bowl with it, add frijoles de la olla, salsa fresca, and crumble cotija cheese and call it comida (main meal of the day). For breakfast, I often prepare frijoles refritos (refried beans). Served with scrambled eggs, sliced Mexican avocado, and a stack of hot tortillas, beans are a great way to start the morning. Here’s some fun bean trivia: frijoles refritos doesn’t really mean ‘refried’ beans. Mexican Spanish often uses the prefix ‘re-‘ to describe something exceptional. ‘Rebueno’ means ‘really, really good’. ‘Refrito’ means–you guessed it–well-fried. Frijoles de la olla are very easy to cook and the fresh-cooked flavor is a million times better than canned beans! In my kitchen I prepare about a pound of dried beans at a time. After cooking, I serve some as frijoles de la olla, prepare some as refried beans, and freeze the rest in plastic sandwich bags. The cooked beans and their pot liquid freeze very well. To make frijoles de la olla, the traditional cooking method I use has no onions, no garlic, no salt, and no other seasonings–just water and dried beans. First, pick carefully through your beans. Put the cleaned beans in a strainer and wash well under running water. Now, to soak or not to soak? I have tried both soaking and not soaking and have noticed that the cooking time is about the same either way. I never soak my beans. My olla de barro (clay bean pot) holds about a half kilo of frijol plus enough water to cook them. If you don’t have an olla de barro, a heavy metal soup pot will work almost as well. After the beans are in the pot, add 6 to 8 cups of cold water. Over a high flame, bring the pot of beans to a rolling boil. Turn the flame to a medium simmer and cover the pot. Allow the beans to cook for about an hour and check the water level. If you need to add more water, be sure it is boiling before you pour it into the bean pot; adding cold water can cause the beans to toughen. Continue to cook the beans until, when you bite into one, it is soft and creamy. The pot liquid will thicken slightly. Now’s the time to salt your beans–after cooking, but while the beans are still hot. I use Espuma del Mar (Mexican sea salt from the state of Colima) for its wonderful sweetly salty flavor, but any salt will do. Add a little less salt than you think is correct–you can always add more later, and you don’t want to over salt your beans. If you live in the United States or Canada, you’ll want to order the fabulous heritage dried beans sold by Rancho Gordo. Its owner, my friend Steve Sando, has nearly single-handedly brought delicious old-style beans to new popularity in home and restaurant kitchens. If you’ve tasted ordinary beans and said, “So what?”, try Rancho Gordo beans for a huge WOW! of an eye opener. Following is a recipe for turning these frijoles de la olla into refried beans. 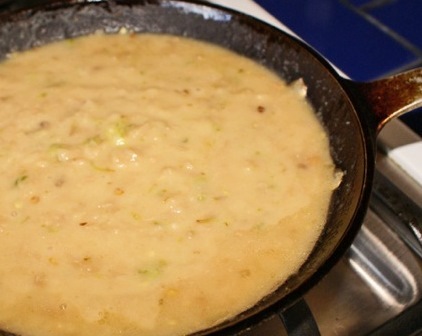 Melt the lard in an 8-inch skillet. Split the chile(s) from the tip almost to the stem and add to the melted lard. Saute over a medium flame until the chile is dark brown, almost black. Allow the lard or oil and chile to cool a bit before the next step. Now add the beans and a little of the bean liquid. When the beans begin to simmer, mash them and the chile with a potato or bean masher until they are smooth. Add more liquid if necessary to give the beans the consistency you prefer. Add sea salt to taste, stir well, and serve. My favorite type of bean for Frijoles de Olla are pintobeans, their flavor is very traditional in taste of Mexico. Now I’ve seen Peruano frijoles, and looking at them don’t really look good to me. So my question is, do they taste just as good as our traditional Mex. pinto bean, or better? I’m willing to try them. Thanks for the tip on Rancho Gordo. I went over, checked them out, and created an account. Looking forward to my first order. hey chris!!! escribeme!!! vivo en sonora!! quisiera cocinar contigo!!! Pati, I just found you n PBS, how wonderful. I moved to New Mexico from New England and have enjoyed learning a new cuisine. I have made many Mexican dishes. We had a restaurant that made Charro beans once a week. I have tried , by taste, to replicate them to no success. No one else makes them. Can you help? Hola Helen, Here’s my recipe for Charro Beans: http://patijinich.com/2011/04/cowboy-charro-beans.html. Thank you for writing to me!! I’m glad you found the show. Hey, this is blog is really a fantastic weblog! I do not normally remark on your wonderful blog posts, I typically just learn them. Even so, after studying this publish, I just had to congratulate you on your excellent work! Keep it up!! I so hate you chicas!,pero eso ya lo saben no?.Frijoles de la olla/fresh cooked beans, frijoles refritos/refried beans; and someone mentioned conchas?? OMG, estoy verde de la envidia. ps I also want to try the “Espuma de Mar” salt, never ever heard of it before..
ya mero nos vemos para cocinar juntas en valle el proximo anio,nos vamos y le damos a la cocinada y vemos a los amigos ! Yes we will! We will make refried beans and eat them with conchas dulces, how about that? Now i know why my beans sometimes come out tough…mental note now to add boiling water to my pot.